Tokay Gecko is a lizard belonging to the Gekkonidae family, native to the rainforests of Asia. They are one of the largest geckos found in the whole world. These reptiles are known by various names in different regions, including tokkae in Malaysia, tuko in Philippines, tokek in Indonesia and kokkek in Zomi. Size: The males can grow anywhere between 11 inches and 20 inches (28 cm and 51 cm) while females reach lengths of 7 inches to 19 inches (18 cm to 48 cm). Weight: They weigh somewhere between 150 gm and 400 gm (5.3 oz and 14 oz). Color: The geckos have grayish or bluish bodies covered with yellow, orange or bright red spots. Males are more colorful compared to females. The brown or greenish brown eyes have a bright yellow to orange pupil. They may change their body color to dark gray with pale bluish spots. Head: The reptile has a large head with strong muscular jaws. Eye: They have large round eyes with a vertically slit pupil. Tail: The geckos have long characteristic semi-prehensile tails. It originated from various regions of Asia with the distribution range extending from the northeast regions of India to Bangladesh and Nepal, through the southeastern Asia and the Philippines to Indonesia and the western parts of New Guinea. The species was introduced into Florida, Hawaii, Belize and certain Caribbean islands during the late 1980s and the early 1990s. They are currently considered to be an invasive species in these regions. These arboreal reptiles generally remain on trees in rainforest areas. But, in some parts of their distribution range, they adapt to human inhabitancy. In the wild, their diet consists of various insects and invertebrates including crickets and cockroaches. They are also known to feed on smaller geckos and even small vertebrates. They are nocturnal in nature which means they are most active during nighttime. Male Tokay Geckos are highly territorial and tend to attack anyone who approaches their territory. These solitary creatures live alone outside of the mating season. They usually avoid humans but can turn very aggressive if cornered. In rural human habitations, the geckos can be seen roaming the ceilings and walls at night, looking for prey. Their mating call is a loud bark that sounds like “To-Kay” or “Gekk-Gekk”. Both the common name and the scientific names of the species originated from these sounds. Even the family name and the generic name of these reptiles are originally derived from their calls. The mating call bears similarity with the calls made by the Large Forest Gecko or Gekko smithii. 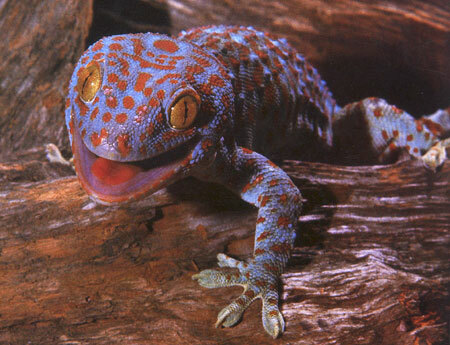 Tokay gecko does not have many predators apart from large poisonous snakes inhabiting the Asian rainforests. The eyes of these reptiles are covered with transparent scales that function as protective lenses. The geckos are often seen licking their eyes for cleaning these scales. The insides of their mouths are dark black in color outlined with the bright pink inner boundaries of the lips. The geckos open their mouths while making a hissing noise to scare away potential predators, who think they are capable of inflicting poisonous bites. Their toes have ridges consisting of specialized lamellae on the toe pads to allow them walk on any type of vertical surfaces including glass and metal. They have powerful jaws along with extremely sharp teeth, enabling them to inflict extremely painful and damaging bites when threatened or cornered. 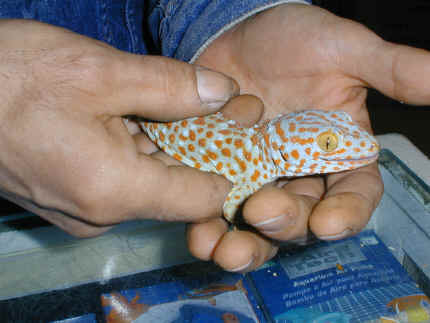 Tokay Gecko is often erroneously believed to be venomous. But, in truth its bite is not poisonous, even though it is quite painful. However, researches show them to carry various bacteria that can cause serious health problems. So, it is crucial to take care of the bite wound as soon as possible, especially if has penetrated the skin. They molt their skin after certain periods of time, breaking the old skin around the head and then stripping it entirely off towards their tails. Like many other reptiles, these geckos often eat their own shed skin. The breeding season for this species begins around spring and continues for 4 to 5 months. The mating season is likely to be triggered by factors such as rains and increased daylight hours. Both males and females become reproductively mature at 1 year of age. The geckos release a fluid from the femoral pores which is believed to help them in attracting the females and in copulation. 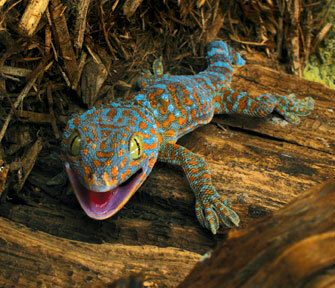 Male Tokay Geckos make a characteristic sound at the beginning of the mating season to find mates. Males are known to mate with multiple females. Females lay eggs once every month during the breeding season. After mating, the females search for a suitable nesting or egg laying site. Once a suitable place is found, they lay 1 to 2 small, oval, hard-shelled eggs and attach them to nearby tree trunks or any other solid foundation. Both males and the females take care of the eggs until they hatch. The eggs hatch into 2 to 3 inches long hatchlings after an incubation period of 2 to 6 months. The young geckos feed on the outer covering of their own skin after being born. They are generally taken care of by the parents. The juveniles exhibit cannibalistic behavior and tend to eat other baby geckos of their own species. They grow teeth shortly after birth and are capable of protecting themselves. They leave their parents at 10 to 12 months of age. The average life expectancy for these creatures is around 10 years in wild. But, they are known to have a longer lifespan in captivity, ranging between 15 years and 20 years. Housing: Being one of the largest geckos in the world, one single Tokay should be kept in a 20 gallon high tank. 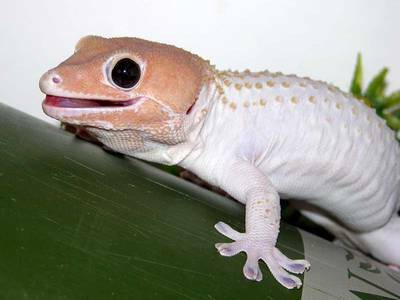 The tank size varies with the number of geckos kept in it. It is an arboreal creature and should be provided with sturdy tree branches and small plants in its tank. Tropical plants like bromeliads, orchids and snake plants are the best options for this gecko. One should also place some rocks, cork bark and logs to provide the lizard with plenty of hiding places to give it a sense of security. Substrate: The substrate often depends on what types of trees are put into the tank. The enclosure needs to be prepared as a terrarium if one is going to plant live plants in it. Paper towels, coconut fiber and artificial tuft can be good substrate choices if one is to put artificial plants in the tank. Temperature: These tropical pets need hot and humid conditions along with sufficient air flow. The daytime temperature should ideally range between 77 °F and 86 °F while the tank temperature should be kept between 68 °F and 77 °F. The animals should be provided with an 85 °F to 95 °F basking spot during daytime. One can use incandescent lights, heat pads or a ceramic heater for heating the tank. Humidity: The tank humidity should ideally be kept between 70% and 90% by misting. It should not drop below 50% under any circumstance. Using the proper substrate helps to retain humidity. Lighting: Adequate lighting is necessary for them to remain healthy. However, no UVA/UVB lighting is required as the nocturnal lizards spend most of the daytime in hiding. Full-spectrum fluorescent lights are sufficient when placed at the ceiling of the cage. A 12-14 hours light cycle should be maintained. Feeding: The diet in captivity includes a wide range of insects including mealworms, crickets, cockroaches and wax worms. Large geckos may be occasionally fed with pinky mice. It is advisable to dust the food with vitamin and calcium supplements to provide them with proper nutrition. Adults should be fed once every two days while juveniles can be fed every day. Temperament: it is ideal to keep just one gecko in a tank due to their territorial nature. It is never recommended to keep more than one male gecko in a single tank when housing them in groups. Two or more males in one tank tend to fight and kill each other. Handling: Taming these wild geckos is quite difficult, and they tend to bite if handled too often. It is advisable to wear protective gloves to avoid the painful bite. One should also wash their hand properly with a disinfectant soap after handling the contents of the tank as the lizards may carry infectious diseases like Salmonella. It is the second largest gecko in the entire world. They attach or “glue” their eggs to walls, packing crates and other objects often resulting in the egg’s being transported to various parts of the world. Then they establish themselves as an invasive species in places with abundant food sources and suitable climate. The eyes of this nocturnal animal cannot see any color apart from black and white as they do not need to distinguish colors at night. 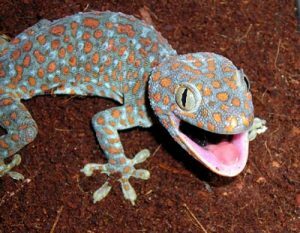 Eating Tokay Gecko meat is believed to cure various diseases such as cancer and HIV. Their populations have not been evaluated yet by the IUCN. But, habitat loss, environment changes and capture for the pet trade are some of the biggest threats to the species. Their populations have become threatened in certain countries such as the Philippines with various wildlife organizations taking legal measures to prevent them from becoming endangered. Check out the following images to get an idea about their stunning appearance.